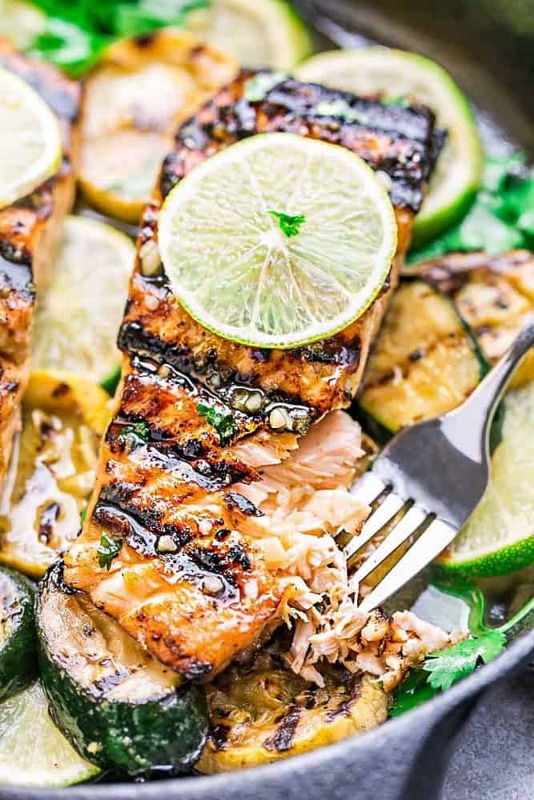 Grilled Honey Lime Salmon is an easy summery dish that is perfect for busy weeknights. Best of all, it’s covered in a delicious honey and lime butter sauce that is sweet, tangy and full of flavor. 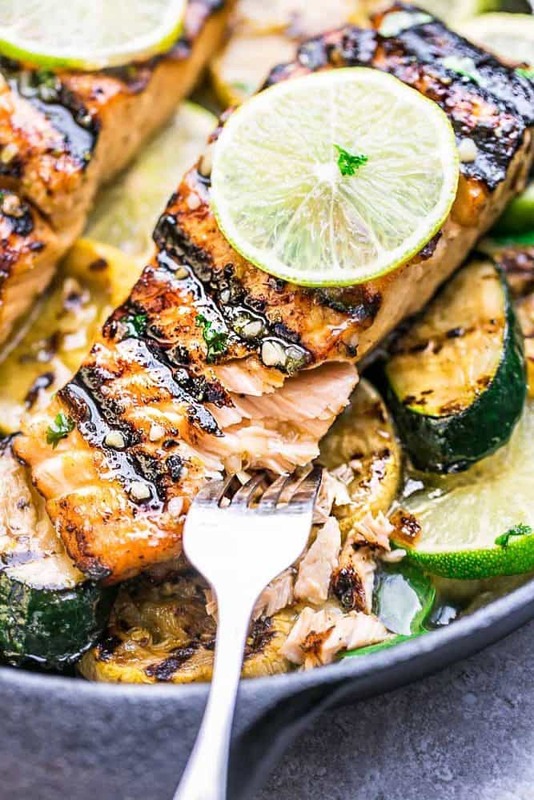 If you’ve never grilled salmon before, you totally have nothing to fear. 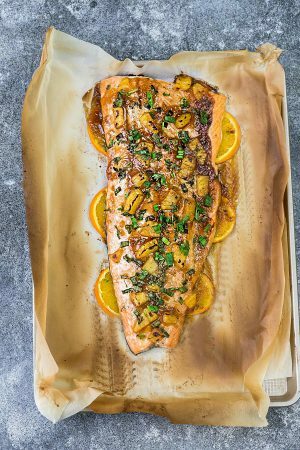 The easiest way is to place the salmon on a piece of parchment paper and then wrap with another layer of heavy duty foil. It makes clean up a breeze and the foil seals in all that sweet and tangy flavor as it cooks. Or you can also place the salmon directly on the grill to get the pretty grill marks. Just preheat your grill for a few minutes on medium high heat and be sure to oil your grill generously. This prevents the salmon from sticking too much. Then cover the grill and cook for about 3-4 minutes, or until you see grill marks. Use your tongs along with a wide spatula to help you gently remove from the grill. 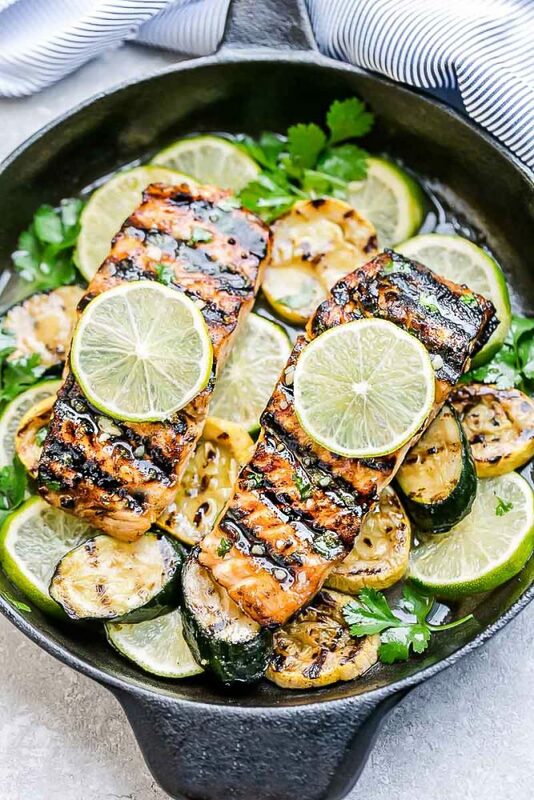 Serve with some lime slices, a sprinkle of chopped herbs and grilled veggies of your choice and you’ve got a great meal to add to your dinner rotation! Season salmon generously with salt and pepper. In a small bowl whisk together the melted butter, olive oil, honey, soy sauce, lime juice, lime zest and minced garlic. Reserve 1-2 tablespoons of the sauce to brush on the salmon once finished cooking. Marinate the salmon in the rest of the sauce for at least 30 minutes before grilling. Once the salmon is ready, preheat your grill to medium-high heat. Brush grill grates with oil. Place salmon fillets on the grill diagonally to the grill grates. Grill with the lid closed for 2-4 minutes (depending on the thickness of the salmon) or until grill marks appear. Use tongs and a wide spatula, carefully turn the fish onto the other side, so that the skin side is now on the grill grates. Close the grill lid. Cook for another 2-5 minutes, again depending on the thickness of the fillets. Salmon should be just barely opaque throughout when done. 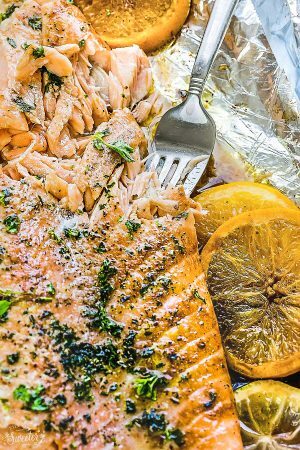 Place each piece of salmon on a piece of large parchment paper on top of a larger piece of heavy duty foil. Add lime slices and drizzle with a spoonful of marinade. Wrap up salmon tightly in the parchment/foil packets. Place the foil packets on the hot grill and cook for 10-13 minutes, flipping halfway through. Remove from grill. To make salmon in the oven: Preheat oven to 425°F. 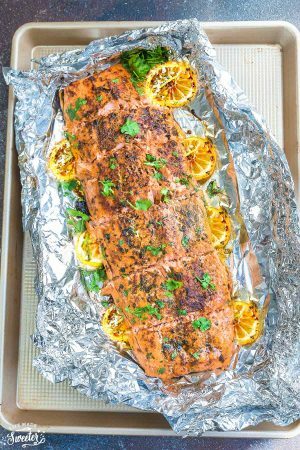 Line a baking sheet with parchment paper or foil and place marinated salmon on top. Roast for 8-10 minutes, depending on the thickness of the salmon or until fish is just cooked through. Turn oven to broil and cook for another 2-3 minutes, until salmon is lightly charred. Brush the tops of the salmon with reserved sauce and serve immediately with lime slices and chopped herbs, if desired.